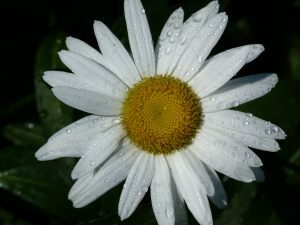 April, the month when flowers start blooming in the Northern Hemisphere, gets its name from the Latin word aprillis, which means “to open.” The symbolic flower of April is the daisy, which was called “Day’s Eye” in merry olde England. Someone (probably a Saxon) noticed that daisies closed their petals over their big yellow eyes in the evenings and unfolded them at dawn. Here are some things to keep in mind as we enjoy this glorious month. April is Autism Awareness Month, beginning with April 2, which is World Autism Awareness Day. Autism is a complex developmental disability that is diagnosed in very young children. It affects development of social interaction and language skills. Because autism has such a wide range of symptoms and levels of impairment, it is now known as ASD (Autism Spectrum Disorder). Since the 1970s, the Autism Society has campaigned to make the public aware of autism during the month of April. The Society seeks to promote acceptance of the tens of thousands of people diagnosed with ASD every year. It wants to “assure that each person with ASD is provided the opportunity to achieve the highest possible quality of life. ” One of the most recognized symbols of the autism community in the world is the Autism Awareness Puzzle Ribbon, which is available in many forms on the Autism Society website, http://www.autism-society.org. The month of April is a perfect opportunity to educate children to be tolerant of people with disabilities and of anyone who is different in any way. April 7 is William Wordsworth’s birthday. He’d be 249 years old this year. I can just picture him as a lad finishing up a piece of birthday cake and thinking, “Hey, I need to write a poem about daffodils.” And licking frosting off his fingers, he set off down the hill with his notebook. It is one of my favorite poems… it just captures the essence of spring, doesn’t it. On the left is a little snippet of the poem. 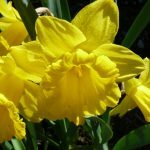 For the full text of the poem, see: https://www.poetryfoundation.org/poems/45521/i-wandered-lonely-as-a-cloud When I read the poem,I think about the lines “And then my heart with pleasure fills,/And dances with the daffodils.” Isn’t that what the Power of Flowers Project is all about… that the sight of beautiful flowers to someone who is alone can fill them with joy and make their hearts dance. It’s why we do what we do. The week of April 7 through April 15 is National Volunteer Week. During his inaugural address in 1989, President H. W. Bush recognized volunteers as “points of light” who demonstrate “how a neighbor can help a neighbor.” In 1991, the Points of Light Foundation was created as an independent, non-profit, non-partisan organization in response to the Senior President Bush’s call to action. I wish we could award a Points of Light Award to each and every one of the Power of Flowers Project volunteers. Our volunteers rock. If The Olympics had a competition for Volunteers, POFP would bring home all the gold. More about our fabulous volunteers in a later post. Leonardo Da Vinci, truly a Renaissance man, was born on April 15, 1452. This astounding individual was a genius, who in addition to being one of the world’s greatest painters, was also an inventor, scientist, naturalist, and writer. Did you know that he kept his writings secret by using a mirror to scribe his ideas upside down and backwards. That fact alone should nudge him into the genius category. April 22 is Earth Day. According to earthday.org, the theme for 2019 is Protect our Species. The website lists several endangered species: bees, giraffes, coral reefs, whales, elephants, insects, sea turtles, the great apes, and others. They place the blame for this problem squarely on human activity. “climate change, deforestation, habitat loss, trafficking and poaching, unsustainable agriculture, pollution and pesticides to name a few.” If we act now, the rate of extinctions can be slowed, but we need to raise awareness about these problems and their consequences. We can also become proactive by stopping the use of pesticides and adopting a plant based diet. Every community has a plethora of Earth Day activities; find out what’s happening around you and take part. Enjoy each and every day of April. Get outside and take a walk, breath the fresh air, and take in the wonderful sights of spring. But to avoid wandering “lonely as a cloud,”bring a buddy!